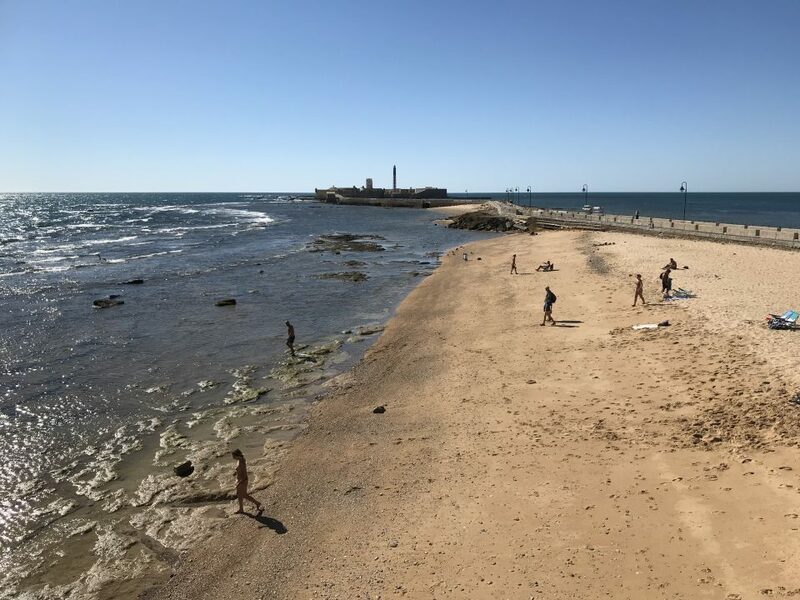 Cadiz was to be our destination for a day-trip from Seville to see the cathedral and its old town. We had a decent night sleep after a great day in Seville yesterday. But we were up bright and early to start our day. Once again we made our way to Sevilla Santa Juste train station to get our train to Cadiz. 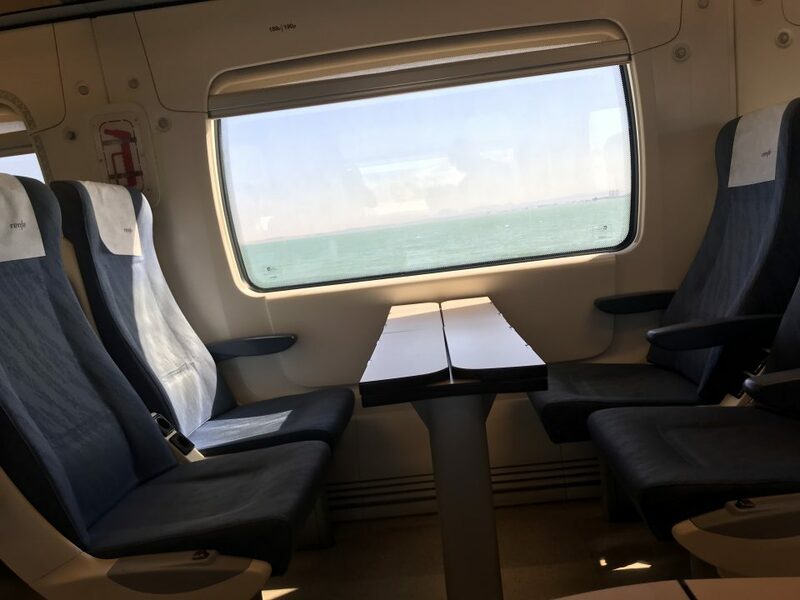 The train journey took 2 hours to reach the Andalusian city of Cadiz. The approach into the city was quite unique in that the sea surrounded us on both sides of the track. Cadiz is considered to be one of the oldest settlements in Europe and was founded in 1100BC by the Phoenicians. The city is famed for its seafood and culture. We aimed to experience both! Oh and maybe some wine too. Only a short walk from the train station we arrived at Plaza de San Juan de Dios. 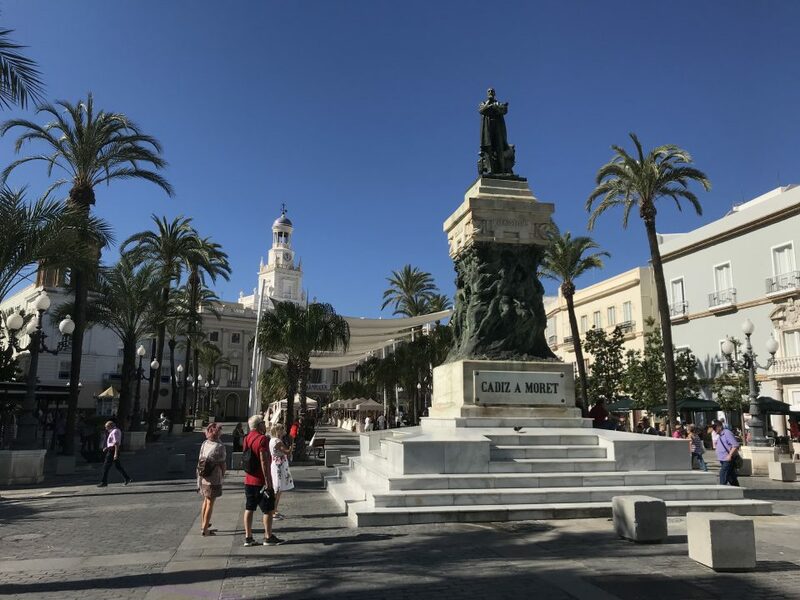 This is the main square of Cadiz and the imposing Town Hall overlooks it. There was a small craft market taking place on the square. Overnight we had the unfortunate news that Hayley’s Grandmother had passed away. Hayley’s family had said that her Nana would still want her to enjoy herself on holiday. So she bought a nice leather ‘don’t worry be happy’ bracelet in tribute to her. 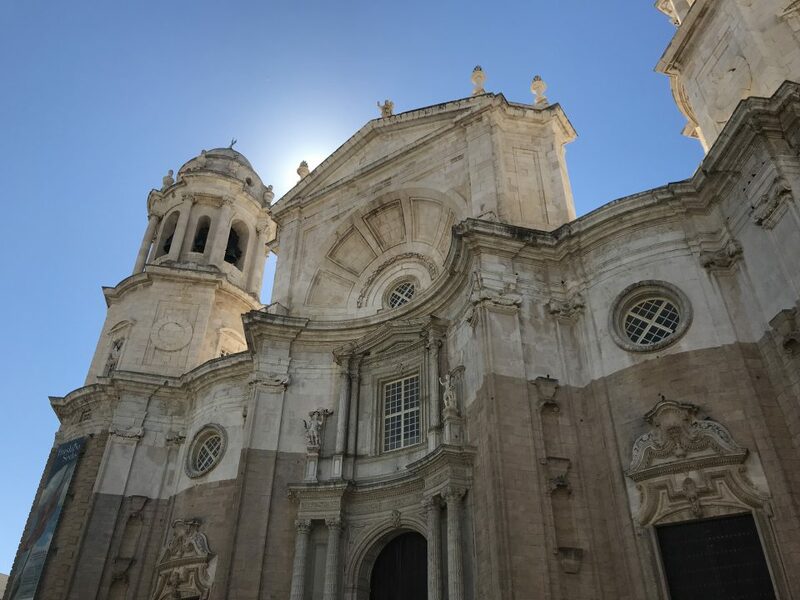 We then walked through the winding narrow streets and arrived at the golden domed Cadiz Cathedral. Built in the 18th century in Baroque style, it dominates the plaza in front of it. There were so many bars and cafes surrounding it, full of tourists. Most of the square was cordoned off as preparations were underway for some form of event. Apparently it wasn’t to welcome us to the city. After the cathedral we visited Libertad Treze Tapiera for a tapas lunch. We opted for tuna and cod potato salad, tuna balls with creamy sauce, grilled Iberian pork sirloin strips, red tuna with mixed mushrooms and Arabian style chicken tabouleh. 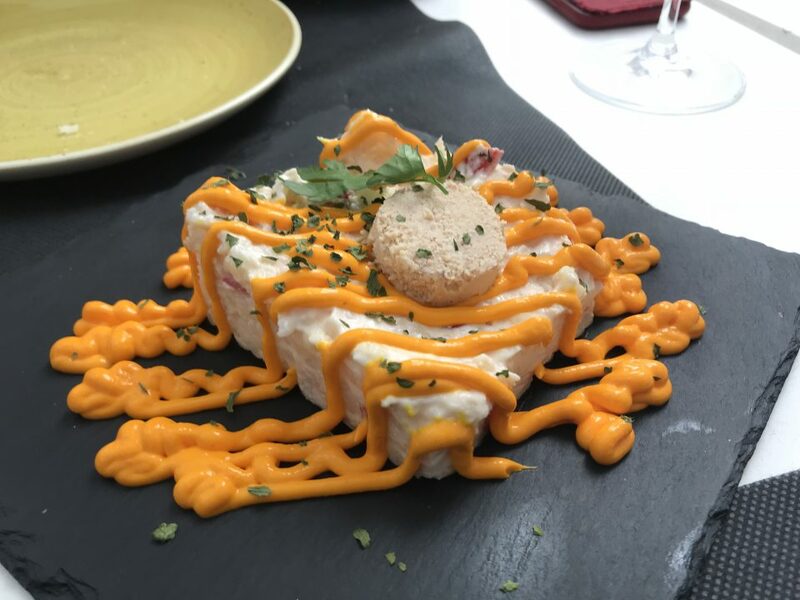 This was easily the best tapas we’ve had all week. The mixture of meat and seafood gave us a different taste to savour. Being absolutely stuffed after our tapas probably meant it wasn’t the best time to visit Mercado Central de Abastos. 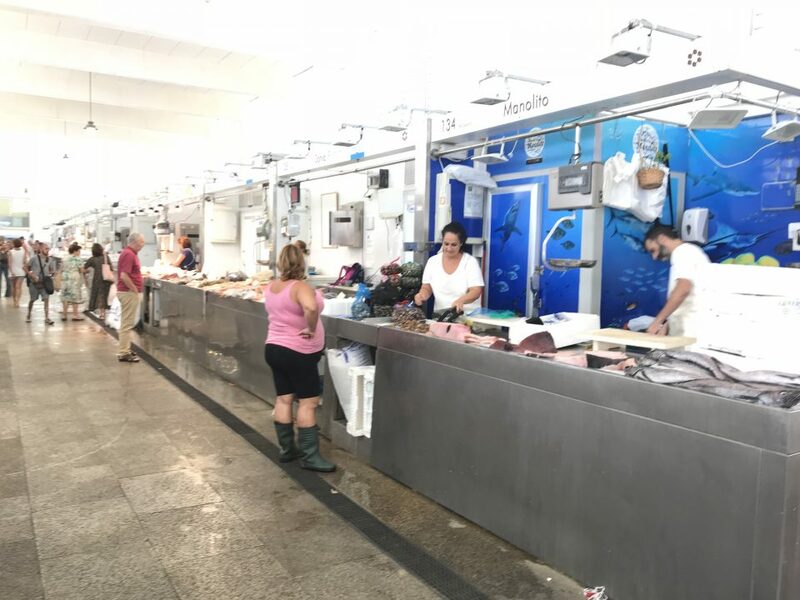 This is the oldest covered market in Spain and specialises in creatures of the sea. Hayley was quite put off by the smell though. Outside, the market is surrounded by a columned courtyard with bars, cafes and mini eateries. We had a drink here and watched the shoppers go about their business. 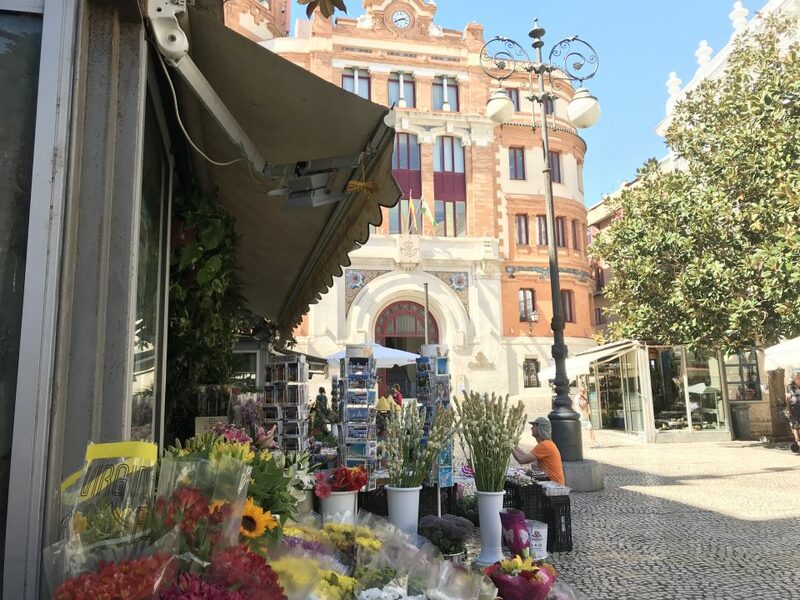 Just north of the market is the colourful Plaza de Topete. It’s colourful because this triangular plaza boasts a beautiful flower market. The stalls offered a wide range of flora for the public to purchase. Luckily the pollen didn’t set off my hay fever! Otherwise I would have have been sneezing for the rest of the day. We then made the short walk to the Tavira Tower. It cost €6 each to ascend to the top of this 45m high tower. Again Hayley moaned all the way up. 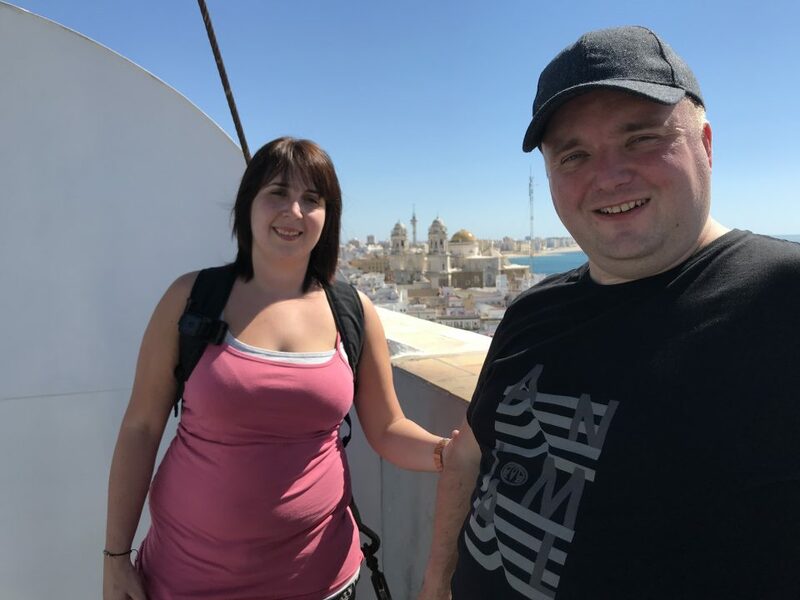 The views of Cadiz were outstanding at the top and it was well worth the admission fee. You could see the whitewashed buildings of the city and the sea in every direction. When we were at the top a lovely elderly German couple offered to take a photo of us. The results of which you can see above. Danke! Hayley would say that no holiday is complete without a trip to the beach. To keep her happy we walked down to Playa de la Caleta beach. We just perched on wall and soaked in the sun for around an hour. A naughty dog kept us amused for most of this time as it constantly tried to tug his owners towel into the sea. After this, I did want to walk across to Castillo de San Sabastian, but the only walkway to get there was closed off for refurbishment. On the way back through Cadiz, the concert I mentioned earlier was in full flow as two elves danced with a rabbit on stage. Yes you read that right! Escaping from that surreal experience our last stop of the day was to be the De la Rosa Arch. 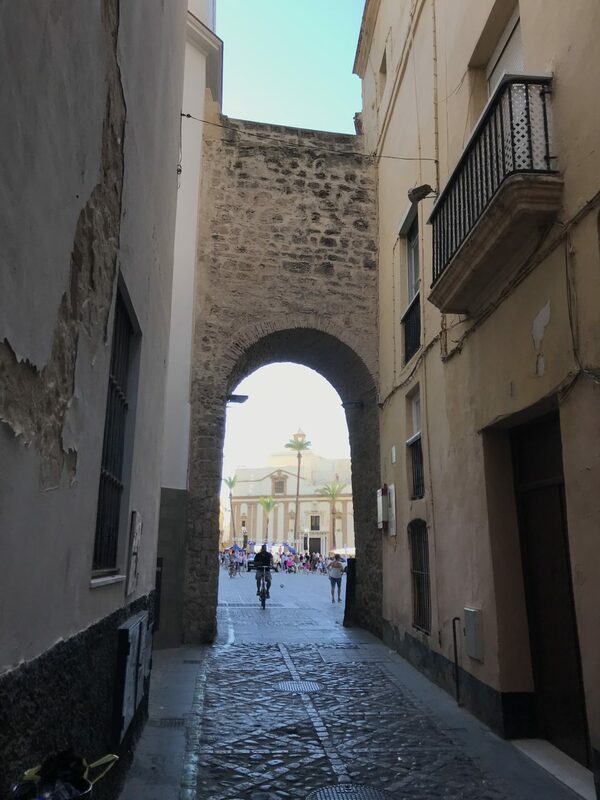 This gateway into the walled area of Cadiz marks the location of the old chapel of the Rosa Virgin. Here defendents of criminal trials prayed before sentence was passed. After this we made our way back to the train station to return to Seville. Today’s blog is dedicated to Hayley’s Nana Irene ‘Rene’ Walker. We would like to thank her for all her love and generosity over the years. We will miss you. Finally, did you enjoy this blog? Or if you have already travelled to Cadiz? Do you have some other suggestions to share? Then remember to leave a comment. Nice blog and dedication today. Was a bit uncertain about the foody elements as me and fish don’t mix! !